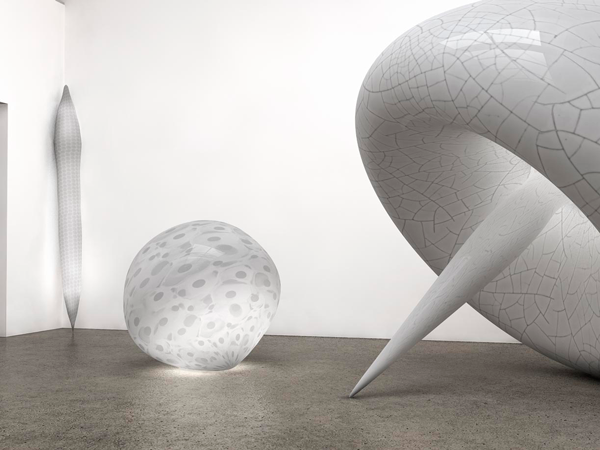 HOW DOES THE DESIGN OF NEW FORMS OF LIGHT LEAD TO A FANCIFUL CAST OF CHARACTERS? Zumtobel is an international manufacturer of lighting founded in Dornbirn, Austria, in 1950. The company partners with some of the best designers in the world to make beauty an integral part of its culture. When I first visited Jürg Zumtobel in Austria I was knocked out by two things. First, the futuristic cube of their robotic warehouse, where machines race to select, assemble, and pack products. Second was the seven-story, lightless testing space filled with sensors for measuring the pattern of light for every fixture the company designs. Technicians can create diagrams that show the precise “footprints” of light as two-dimensional shapes so architects will know exactly how the light will behave. Every year Zumtobel commissions a different artist to create an annual report, which serves not only as a corporate summary but also as a work of beauty in itself. For the report I designed in 2002, I was inspired by the science and art of lighting. I imagined the two-dimensional technical diagrams of lighting footprints as three-dimensional objects, with patterned surfaces lit from within. I then created a virtual gallery of these “light art objects” for the report. About eight years later, I was invited as an artist-in-residence at Dale Chihuly’s Pilchuck Glass School north of Seattle. There I had the opportunity to make these virtual light objects real with a team of skilled glassblowers. 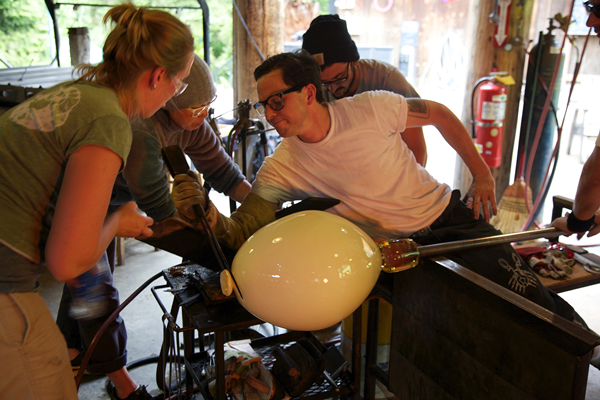 Creating glass works at this scale and complexity required the assistance of the whole Pilchuck community. Joining two glass objects into one, a technique known as incalmo, is one of the most challenging glassmaking processes. During this collaboration, we discovered something else—BigHeadLittleBody—a cast of fanciful characters that emerged in the creative process. Initially realized as glass objects, Big Head Little Body has since taken on a life of its own in other mediums. What started as Zumtobel’s annual report has become a personal exploration of beauty.